As I unroll the reels of my life’s movie, the stories of my mother and grandmother, two women who shaped my growing up unravel before me. All three of us have lives distinctly different from each other’s. Yet, when I look closely, I see we have all been shape shifters — slipping into moulds we scarcely anticipated, not necessarily with ease or delight, but always with the readiness that our circumstances demanded. 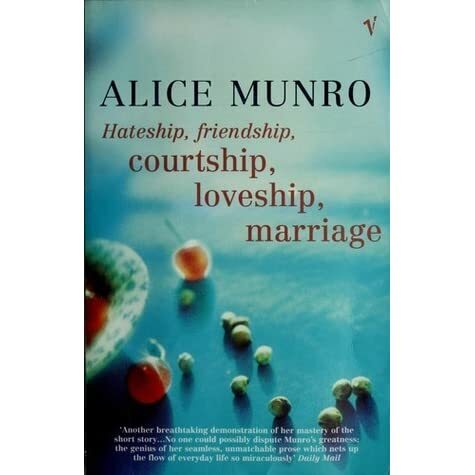 In Hateship, Friendship, Courtship, Loveship, Marriage, Alice Munro’s collection of nine short stories, I found many of our comrades — women across small towns and big cities juggling domesticity and the rigours of the professional world — slipping into and out of moulds and bearing the consequences of their actions with or without grace. The book derives its title from a counting game young girls play with the names of potential boyfriends. Yet time and again, Munro’s adult protagonists prove that their lives need not remain constrained within the clusters of hateship, friendship, courtship, loveship and marriage. Like an ocean’s waves that don’t adhere to a boundary while undulating, the women of Munro’s stories don’t hesitate to spill outside the defined perimeters of their existences. In the opening story, which shares the book’s title, Johanna takes the bull by its horns, torso and tail, when unbeknownst to herself, she falls for a prank played by two young girls. The girls write her love letters on behalf of one of their fathers, who lives in a different province. Johanna finds not just emotional succour in the letters, but true to her working-class industry, she smells an opportunity to banish her status as a pitiable spinster once and for all. Johanna’s success in achieving what she sets out to establishes the book’s tone. In Munro’s more-real-than-real-life stories, women are not always in control of their destinies — sometimes by choice and at other times, without any. But what arrests the reader is their remarkable refusal to be pathetic, sympathy-arousing creatures. And they accomplish this with utterly ordinary, non-awe-inspiring actions. In Floating Bridge, my favourite story of the collection, Jinny, a cancer patient, steps into the light — metaphorically speaking — even as she is engulfed in darkness. Thanks to a stranger, a young man, she walks on a floating bridge for the first time while her husband socialises with the same man’s family. But that’s not all. Jinny also receives the youth’s passionate kiss as he guides her steps on the bridge — an affection without any nomenclature, a fleetingly eternal moment of breathtaking freedom. Weaving inter-generational tapestries that span not just months or years but decades isn’t an easy act to pull together in short fiction, but Munro achieves this with the effortlessness of a teenager’s unabashed giggle. Even as the characters and stories swing back and forth in time, one is left amazed and bewildered by the author’s ability to carry the innocent reader through her intricately mapped-out territories. This is brilliantly evidenced in Family Furnishings, a story that interlaces family drama, the female protagonist’s brisk, nonconformist quips clashing with the deep-set conventional thinking of other family members, and finally intrigues and secrets that make the reader see the same character in a completely new light. In this collection, Munro explores the idea of fidelity in marriage in more than one way, with no easy answers or moral positioning for the reader. And not all trespassing, if one could call them, happen in a blatant, deliberate manner. Stories like Comfort, What is Remembered, and The Bear came over the Mountain show how ephemeral and impulsive a moment of ‘stepping out’ can be at times. And not necessarily sexual in nature either. Memory can be a treacherous, manipulative and even therapeutic poultice. We realize this while reading the layered narratives of Nettles, What is Remembered and The Bear came over the Mountain. In What is Remembered, Meriel cherishes the sole pulsating whiff of an extramarital affair that breezes through her long married life, yet she wants to remember things differently than the actual sequence of events that took place. Transitions — geographical and otherwise — often form the metaphorical motif of Munro’s stories. Nettles, Queenie and Family Furnishings, chart the perplexity-ridden phase between young adulthood and grown-up in Munro’s spade-is-a-spade candour. And it is this sense of negotiation, the constant trading of emotions, personal space, the necessity of belonging — that guides Munro’s characters, especially her women. This is not always easy or even plausible and must be done on the sly, but the women that we come across in Hateship, Friendship, Courtship, Loveship, Marriage aren’t shy of doing so. I came to Munro as a reader with her first book of stories, Dance of the Happy Shades. Every story in that anthology charmed me as I read about young girls and women at crossroads, getting a taste of the bitter truths of life and coming of age. In Hateship, Friendship, Courtship, Loveship, Marriage, I met women who had already come of age and were mature and daring enough to dance and even miss a step or two on the paths that beckoned them. Whenever I read Munro, I am seized with both the thrill and dread of a scientist in a laboratory, who discovers the minutiae of organic life under a microscope. Munro turns the spotlight on lives around us with such astonishing alacrity that it is but impossible not to find strains of one’s own living reality in her stories. The modern-day fables in Hateship, Friendship, Courtship, Loveship, Marriage hold a clear-as-daylight mirror to women’s lives — imperfect and rocky, but never without the possibility of a spark, a fresh leaf and a redeeming edge.